Fig. 1. 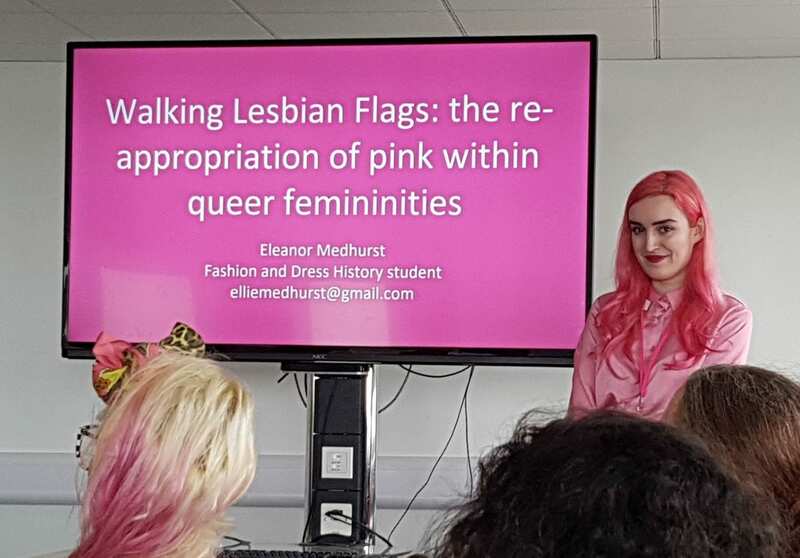 Eleanor Medhurst presenting at the Lesbian Lives conference 2019. Brighton. @QueerCodeQR on Twitter. 15th March 2019. Web. 17th March 2019. BA Fashion and Dress History student, Eleanor Medhurst, reflects on making a conference presentation from her dissertation research. 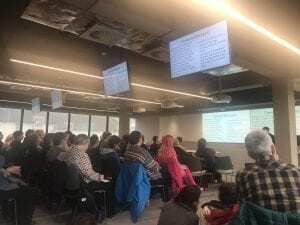 Over the 15th-16th March 2019, the Lesbian Lives conference came to the University of Brighton. This was the first conference that I have attended and presented at alone, and it was an immensely satisfying, enriching and inspiring experience. When I found out that my abstract had been accepted, I was so excited to be able to share my research – a topic that I have a personal connection to and have been passionate about for a long time – with a wider audience. These were people who, while thinking in depth about queer and lesbian theory, largely had not studied theories of dress (as opposed to the people that I study with on my BA Fashion and Dress History degree). I registered for the conference supported by the School of Humanities, with Professor Stephen Maddison, the Head of School, agreeing to help cover the registration fees. This is something that I am very grateful for, and I would like to publicly thank him here. I presented my paper on Panel 4, alongside American academic Erin J. Rand. Rand’s paper “Ravishing Resistance: The Radical Aesthetics of Queer Feminine Fashion,” explored how queer feminine fashions have the political potential to demand hypervisibility of lesbian women and queer people. This was a topic that came at my arguments from slightly different angles. While I talked specifically about pink as a form of reclaiming femininity outside of heterosexual-patriarchal constraints – of re-writing the language of oppressive stereotypical femininity – Rand made the case for feminine fashion as a creative queer and gender-bending space. Our two talks were taken very well, with a varied discussion afterwards. Many people showed appreciation for my research, either expressing that it was a topic they hadn’t thought about before, or that they deeply related to it. It was validating to have my work received in such a way by the community that it is about. Fig. 2. 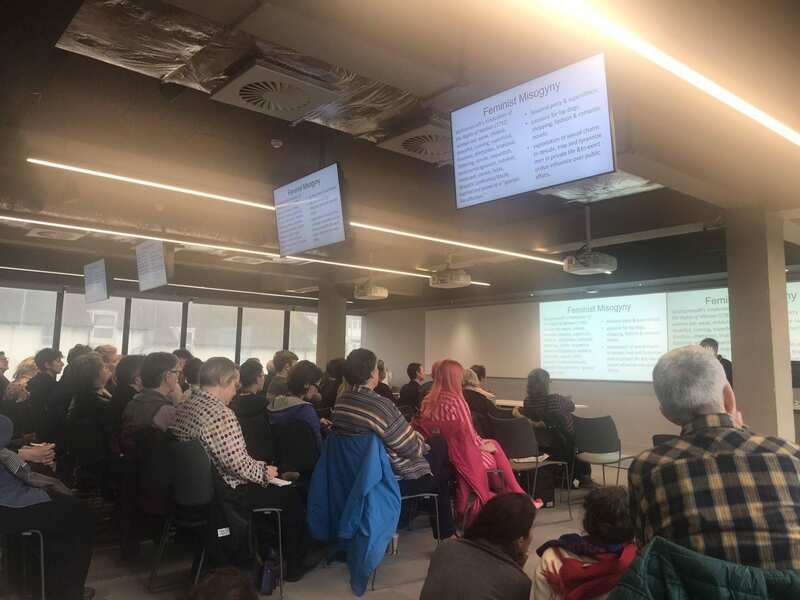 Audience at keynote speaker Katherine O-Donnell’s talk at the Lesbian Lives conference 2019. Brighton. Claudia Carvell @ClaudiaCarvell on Twitter. 16th March 2019. Web. 17th March 2019. The Lesbian Lives conference was an event that brought me closer to my communities, both academically and personally. It was an opportunity to share my work, but also to hear the work of others. I relish the thought of going back in years to come.